Flow Switches Are Used For Electrically Operated Equipment Such As Signal Lights, Alarms, Motors, Automatic Burners, Metering Devices And More. Flow Switches are made of hardened stainless steel bearings and paddles to provide long lasting durability and to mimimize friction. Includes two electrical knockout ends, 1" NPT connection and sealed Monel bellows. FS8-W General Purpose Liquid Flow Switches are used for environments that require water and dust tight NEMA 4X flow switch. 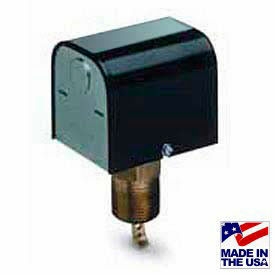 FS7-4 & FS7-4W Industrial Liquid Flow Switches are used for hydronic systems, air conditioning and refrigeration. 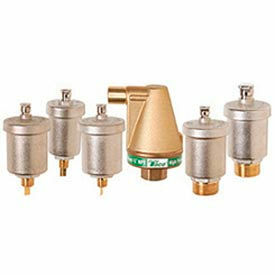 With 1-1/4" NPT connection made with brass with sealed tube construction. Magnetic switching mechanism eliminates need for bellows. Adjustable screw provide easy flow adjustment. UL/CSA listed. Dimensions vary. Hoffman&TRADE; Water vents are used for use with hot or cold water or glycol mains and process applications with specific gravity greater than 0.7. Vent is tapped at top for 1/8 NPT safety drain connection for discharging moisture. Includes a built-in check valve. Automatic Air Vents Can Be Attached To The Boiler Or Used Throughout The System For Increased Efficiency. These air vents automatically purge unwanted air from any hydronic installation. Coin Vent can be installed on water or steam radiators. Features hygroscopic cellulose discs in the valve body that creates a positive shut-off. Hy-Vent® Air Vents have a high capacity float with operating temperature ratings up to 250 psi. Made using a brass body with nickel plated vents. Waste Connector screws onto the outlet connection of Hy-Vent® models to provide a worry-free installation. Taco® Air Separators Deliver The Most Complete And Effective Means Of Air Removal On The Market. Air separators eliminate damaging effects and irritating noise caused by unwanted system air. 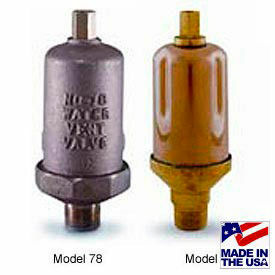 Used in systems with up to a maximum temperature of 240°F and pressure of 150 psi. 4900 Series Air Separators are designed for the complete elimination of air from closed loop heating and cooling systems. PALL ring process removes air. Made using a brass body with integral shut-off valve. VorTech® Separators provide an enhanced level of air removal in hydronic heating, cooling or combinational systems. Made using a cast iron body with Viton O-ring and stainless steel cartridge. 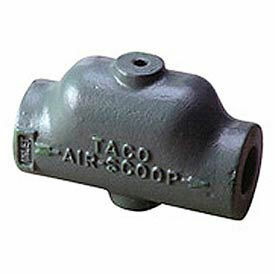 Taco® Air Scoop® Provides An Economic Way To Integrate Air Elimination With The Connection Of A Plain Steel Or Diaphragm Expansion Tank. Enlarged design with internal baffles helps slow the water velocity in order to separate the air from solution. Provides noiseless, air-free hydronic heating, cooling or combination system by efficiently separating out the air from the water. Made using one-piece cast iron. Maximum operating pressure of 125 PSI and operating temperature of 300°F. 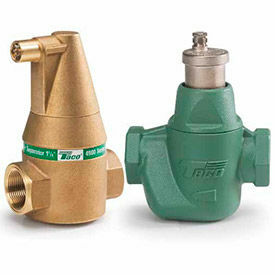 Taco® Tank Drainers Provide Effective Air Control In Hydronic Systems. 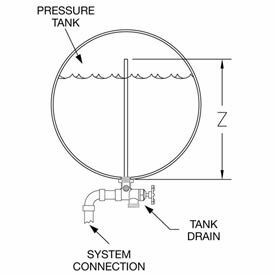 Tank fittings maintain adequate air cushion to provide sufficient pressurization against all fluctuations of water volume. Tank drains maintain collected air within the pressure tank and allows air to pass freely into the tank. Restricts gravity flow of water between the tank and the system, resulting in lower tank temperature that minimizes re-absorption of air. Includes a single handle shut-off.